Last week when Google-ing various pumpkin foods to try, I came across an image of pumpkin [spice] cream cheese. My mind was blown. Cream cheese is one of my favorite things in food, sweet or savory, and I am a pumpkin crazy; how I had never heard of pumpkin [spice] cream cheese before this point was beyond me. But now that I know it exists, I am determined to purchase all the different brands I find (and review all of them, of course). Which brings me to this review. While I was in line, I also saw on the poster advertising pumpkin smear that Einstein’s also had pumpkin bagels. Could this week get any better? I was practically drooling in anticipation while my pumpkin bagel was in the toaster. The bagel, unfortunately, was not up to par. 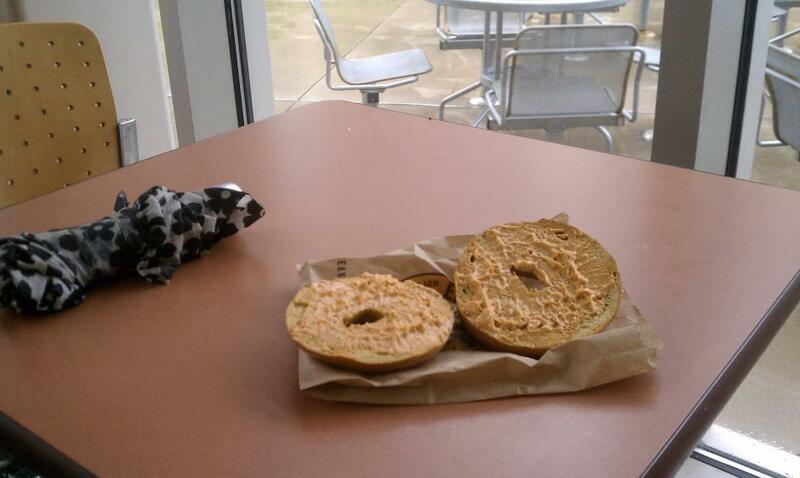 It was by no means a bad bagel, but I tasted no pumpkin! The pumpkin spice made its presence known in the way cinnamon does in a cinnamon raisin bagel, and I enjoyed that flavoring, but when you advertise your bagel as a “pumpkin bagel,” I need to taste some pumpkin. Very disappointed from a place known primarily for it’s bagels. Now on to the superior pumpkin smear. This was just plain heavenly. The spice tones were subtle, but that is how I prefer pumpkin spice in pumpkin foods generally. It is a very sweet cream cheese, which suited me and my sweet tooth well, and there was no denying the presence of pumpkin. The texture is the only aspect preventing this delicious cream cheese from receiving the highest rating it could achieve; it was too soft, almost like butter, not like the more firm and dense cream cheese to which I am accustomed. But that will not keep me from giving it a positive score, nor will it prevent me from ordering this again. This time, though, with my usual honey wheat bagel. I was always upset over how spicy it was and not pumpkin-y. spice latte from Starbucks with an equal emphasis on pumpkin AND spice. A drink I was not aware of for the longest time was the Starbucks Pumpkin Pie Creme. pumpkin spice latte without the coffee. Thus, she got a Pumpkin Spice Creme. While it's not a drink I would drink too regularly now, it was better than I expected. who also want to participate in the pumpkin fun.